People are working on the go more and more. Those people usually require a thin and light, yet sturdy device to work on while they are traveling. Lenovo have released a new notebook suited to this kind of use. The E31 Notebook is a thin-and-light notebook with a sturdy build and affordable price, and it comes with internals that can power most business applications. 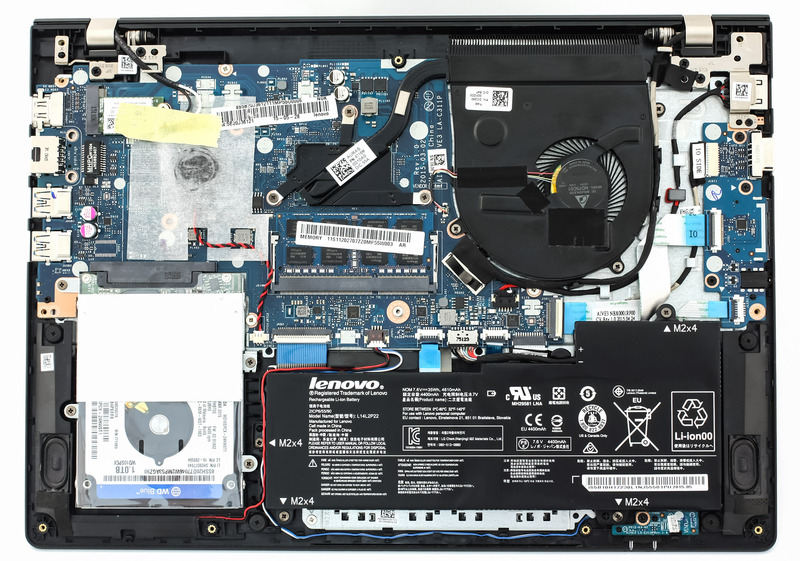 The E31 has some great specs – an Intel 5-th generation Core i3, i5, or i7 CPU, up to 8GB RAM, integrated Intel HD Graphics, a choice of up to 1TB HDD or 256GB SSD and a pretty decent amount of connectivity options. There is also an option to choose either TN HD or IPS Full HD panels, both with matte finish. The starting price of the device is around 500 EUR. We have a standard packaging. The notebook comes with the charger and manuals, in a compact cardboard box. 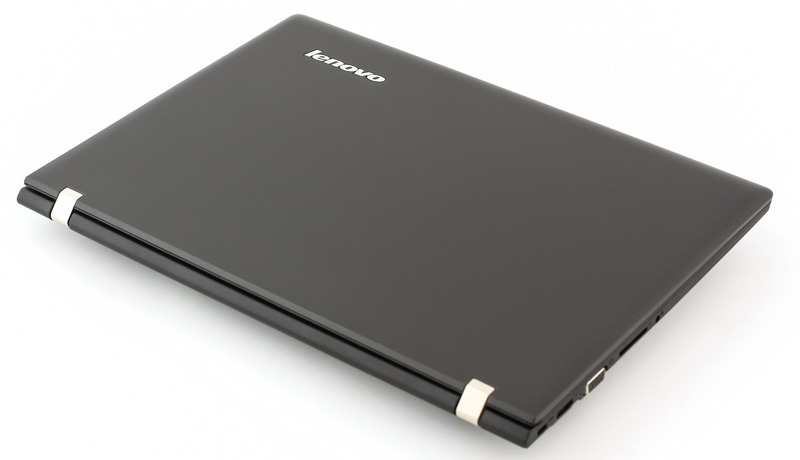 The Lenovo E31-70 has nice clean looks and feels pretty sturdy for an all-plastic notebook. It bears some similarity to the ThinkPad series notebooks, although some signature elements, such as the red TrackPoint in the middle of the keyboard, are missing. Still, the overall feel is pretty close to the iconic series. 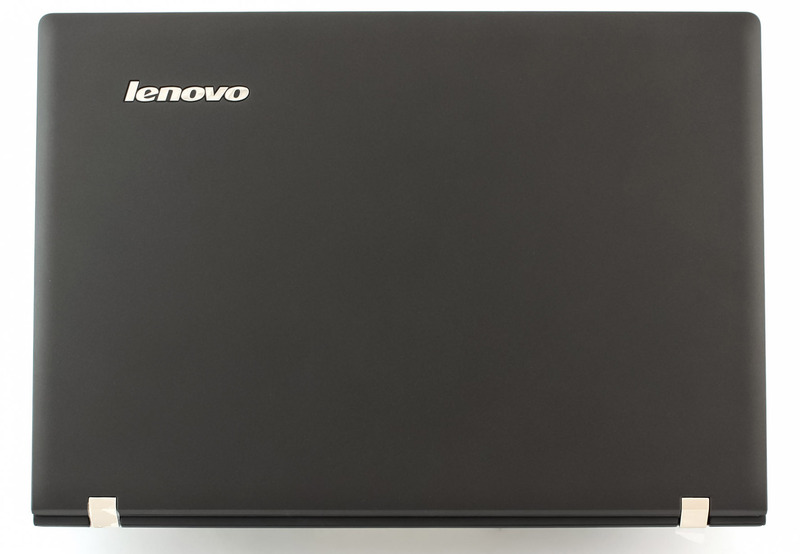 Starting off with the top – the notebook comes with a slightly rubberized plastic lid that offers good grip.The glossy Lenovo logo is in its usual place in the top left corner. On other side of the lid, top portion of the bezel, are the usual microphone and webcam. The latter is surrounded by a nice red circle, with the matte 13.3” Full HD screen right underneath. The lid can be laid flat on a desk or a table thanks to the flexible 180° hinges. They are tight and hold the screen firmly in the desired position, but they are not overly tight, so you can open the lid with one hand. Besides the red accents around the device, the hinges are the only thing standing out from the otherwise all-black design of the notebook. The sides are chamfered nearly all around the notebook, and the ports on the left and right are pushed to the rear half, while the front is reserved for the speakers. On the left we have a combo audio jack, memory card reader, VGA, DC-in indicator LED, AC power connector and a Kensington lock slot. The right side holds a OneKey Recovery pinhole, two USB 3.0 ports (one always on), Ethernet and HDMI. The front houses two LEDs – battery and HDD status, while the back is taken up by the heat exhaust grill, which strangely enough only blows hot air out of its right side. The bottom of the device is a whole piece – there is an exhaust grill that can be used with an external cooling pad. Opening the lid reveals a piece hard plastic all around the keyboard and the palm rest. The keyboard is the now standard Lenovo AccuType with island-style, evenly separated buttons. It is comfortable to type on for long periods of time and has long key travel. There is some slight bend in the center when force is applied, but it should not be a problem under normal usage conditions. Below the keyboard we have the trackpad – it is fast, responsive and has great sensitivity. The left and right buttons are physically separated and have a narrow red stripe on the top which serves to highlight their separate status. The buttons have long travel, but are very responsive and really easy to press. To the right of the trackpad is the (optional) fingerprint scanner for added security. You can read more about its functions in the software section of the review. 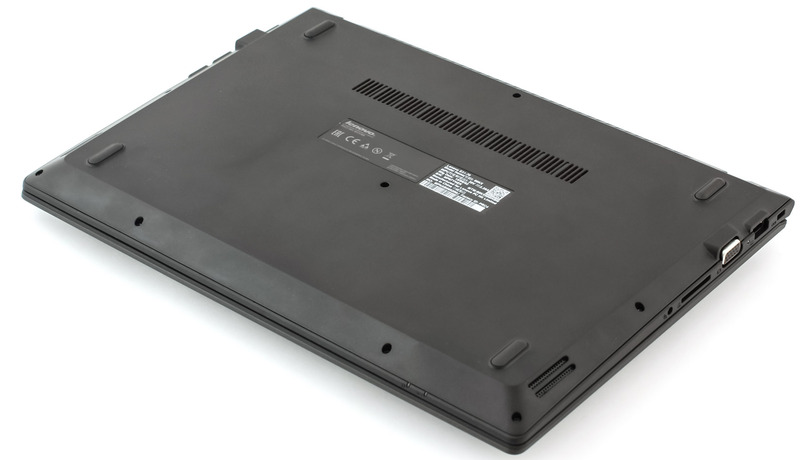 Overall, for an affordable business notebook, the E31-70 offers great clean looks and a pretty sturdy build. The all-black design and light red accents around the webcam and the trackpad add a slight ThinkPad feel, although this is most certainly not a device from that line. The notebook is easy to grip thanks to the slightly rubberized lid, while the flexible 180° hinges hold the lid firmly in position. 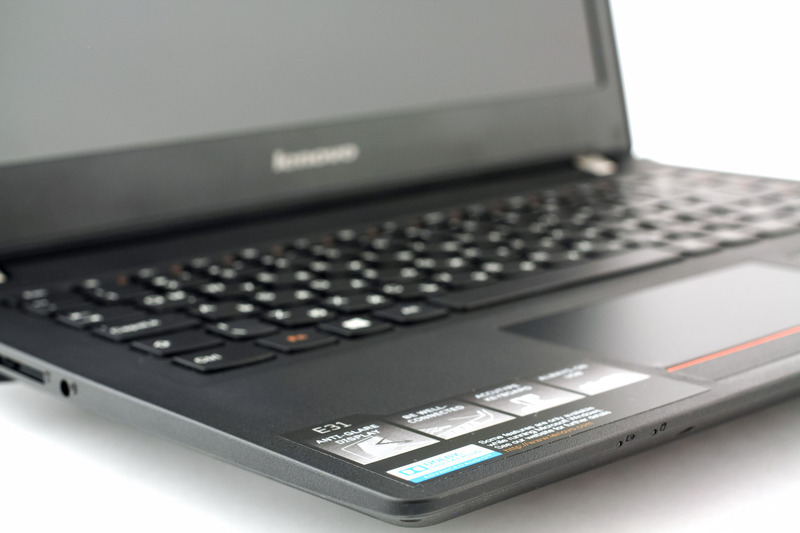 Lenovo E31 also offers responsive keyboard and trackpad input, as well as solid range of connectivity options around the sides. Lenovo E31’s display comes with a Full HD IPS panel with matte finish, model number LGD LP133WF2-SPL1. It has a diagonal of 13.3 inches (33.78 cm) and a resolution of 1920 x 1080. The aspect ratio is 16:9, pixel density – 166 PPI (pixels per inch), and the pixel pitch is 0.153 x 0.153 mm. The screen can be considered “Retina” when viewed from a distance higher than or equal to 53 cm. 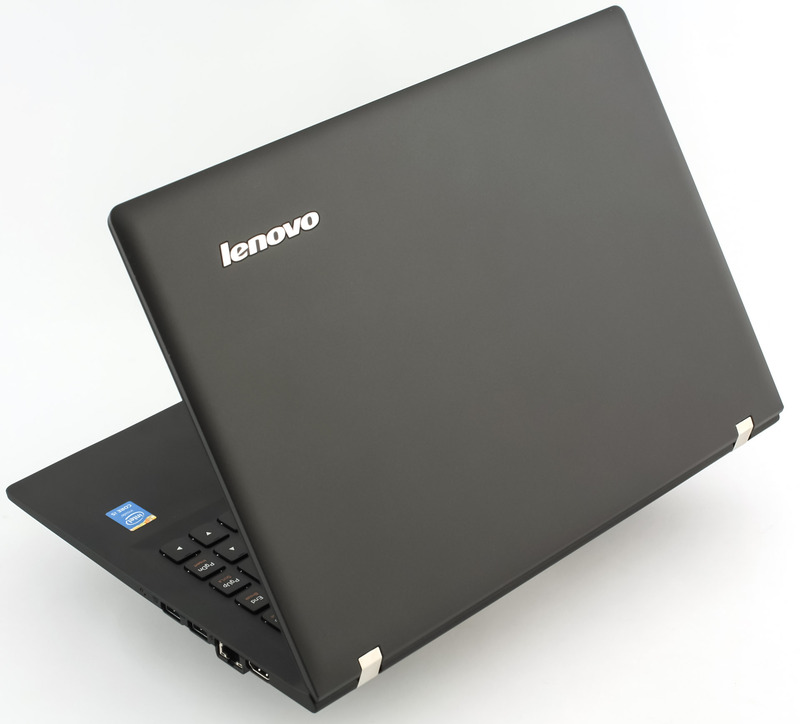 Lenovo E31 has comfortable viewing angles. You can see what the screen looks like at 45° in the image below. The maximum brightness we were able to measure on E31-70’s panel before profiling was 235 cd/m2, with a deviation of only 4%. We consider that sufficient for work in well-lit rooms, but not outdoors. 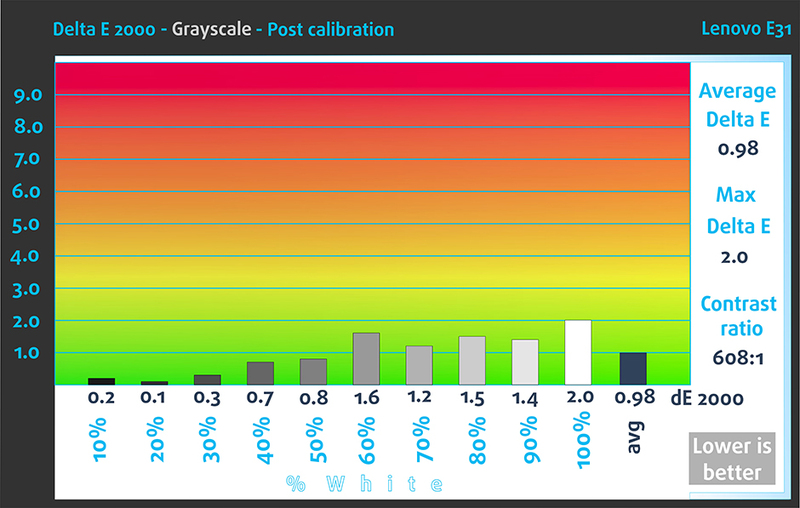 The average color temperature on the surface, measured on a white screen and maximum brightness is 7483K – colder (but not critically) than the optimal 6500K light, with no unacceptable deviations. To put things into perspective, we would like to give you a little introduction into the sRGB and Adobe RGB color gamuts. The CIE 1976 Uniform Chromaticity Diagram represents the spectrum of colors visible to the human eye, thus giving you a better perception of color gamut coverage and color accuracy. Inside the black triangle you will see the standard color gamut (sRGB), used by millions of people in HDTV and on the Web. As for Adobe RGB, it is used to work with professional cameras and monitors when preparing print. Basically, colors inside the black triangle are used by everyone, and so reproducing them accurately is key in a quality display. 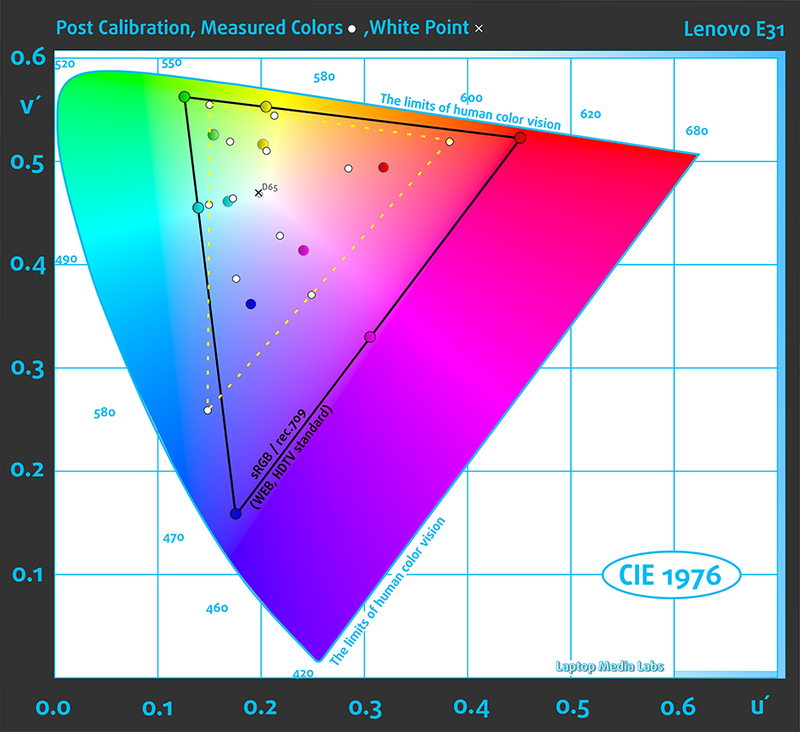 The yellow triangle indicates the color gamut coverage of Lenovo E31. 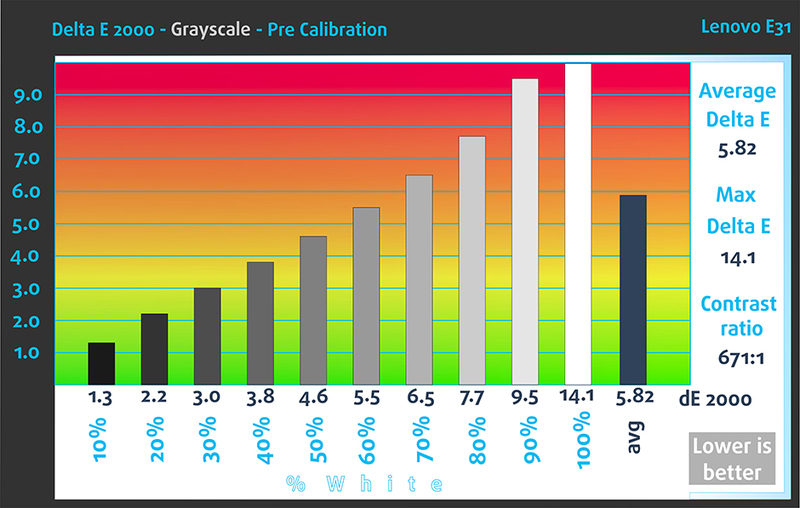 It covers 61% of sRGB and 46% of Adobe RGB. Overall, this is not sufficient for a fully saturated image. The image below shows practically the same thing but with recorded measurements. On the left – before profiling, factory settings, and on the right – after profiling. The colored circles represent reference colors (sRGB/rec.709 Standard Color Gamut Reference Colors) and the whites show the colors actually reproduced . 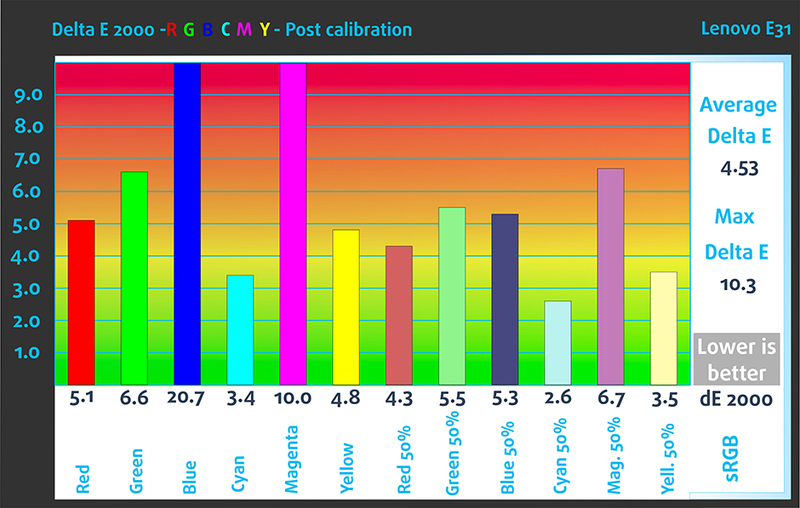 The primary and secondary colors are shown with 100% and 50% saturation respectively inside the sRGB gamut. We profiled the display at 140 cd/m2 brightness and color temperature of 6500K. For calibration purposes we use X-Rite i1Display Pro. We tested the colors before and after recording the profile in Windows. Due to the insufficient sRGB coverage some of the colors with 100% saturation (red and purple) are replaced with the closest possible, resulting in a somewhat dull image. The display’s white level distribution is close to the optimal. We tested the display with 24 color samples, including commonly used colors and ones the eye easily recognizes – dark and light human skin, blue sky, green grass, orange and so on. 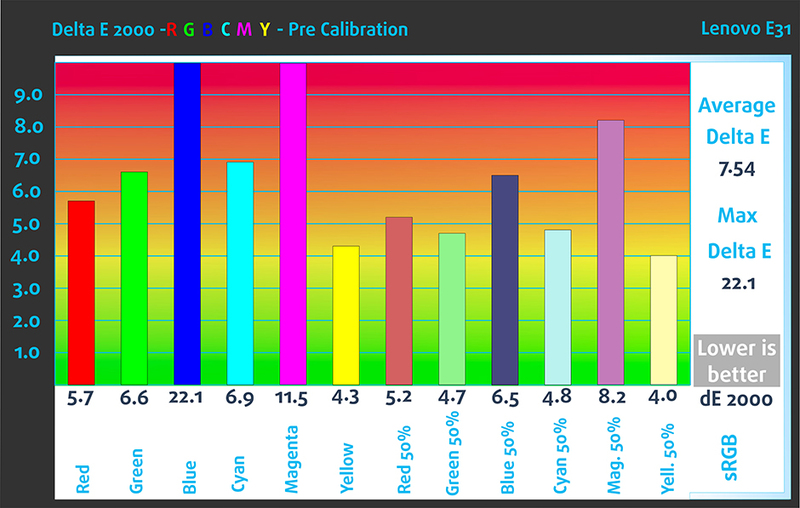 Most of them are in the middle of the color gamut, and after profiling their accuracy is very high – average DeltaE2000 is 0.81. Ninety percent of the colors will be so accurate that the difference can only be distinguished by use of specialized equipment (Average deltaE of the lowest 90% = 0.59). Video playback will have real colors. 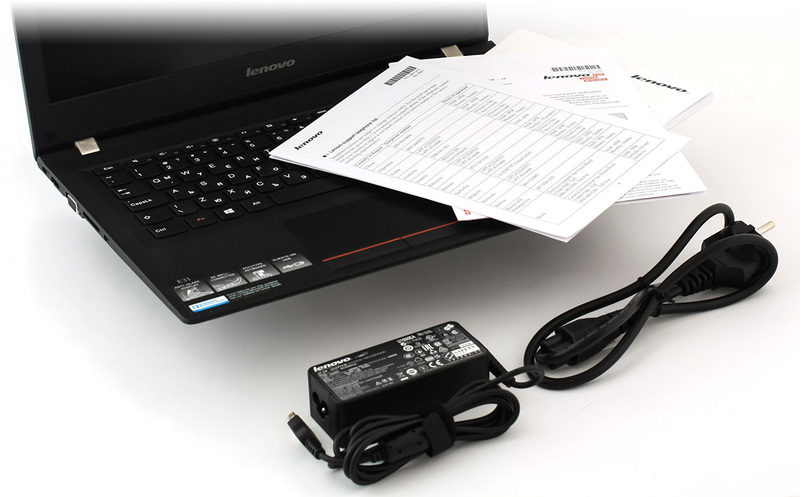 Lenovo E31′ backlight emits PWM light for all brightness levels but 100%. Fortunately, the frequency is really high – 31 kHz, or about a hundred times faster than what is considered to have negative effects on the brain. The image below is mostly useful for gamers. It illustrates the response time of the pixels in modes from “Black” to “White”, plus “White” to “Black” for levels from 10% to 90% and back. We measured Fall Time + Rise Time = 19.6 ms. The display of Lenovo E31 comes with a high resolution, decent contrast and comfortable viewing angles. It is suitable for web browsing, watching movies and using business applications, not including presentations color work. 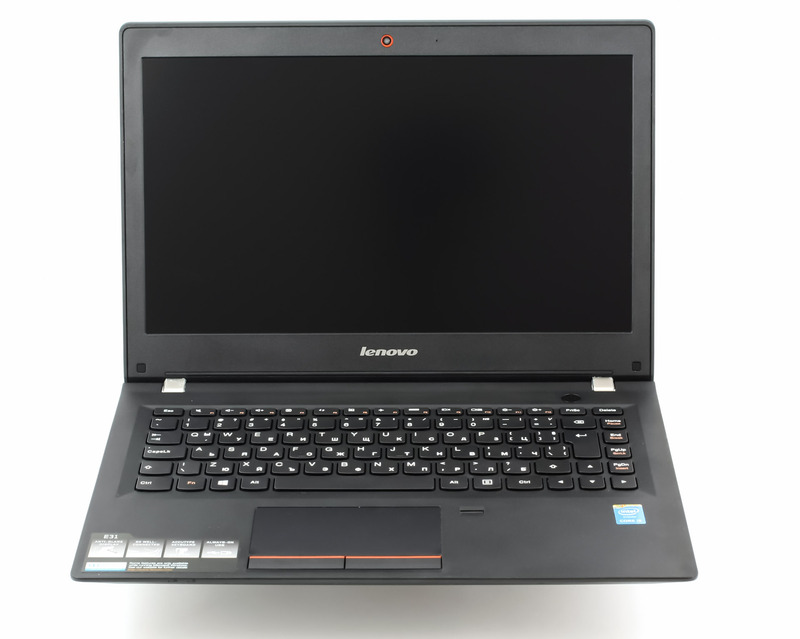 Lenovo E31 offers sound with fairly good quality and high maximum volume. There is some loss of clarity and slight distortions in the higher frequencies. Overall, the quality is average for this type of notebook. 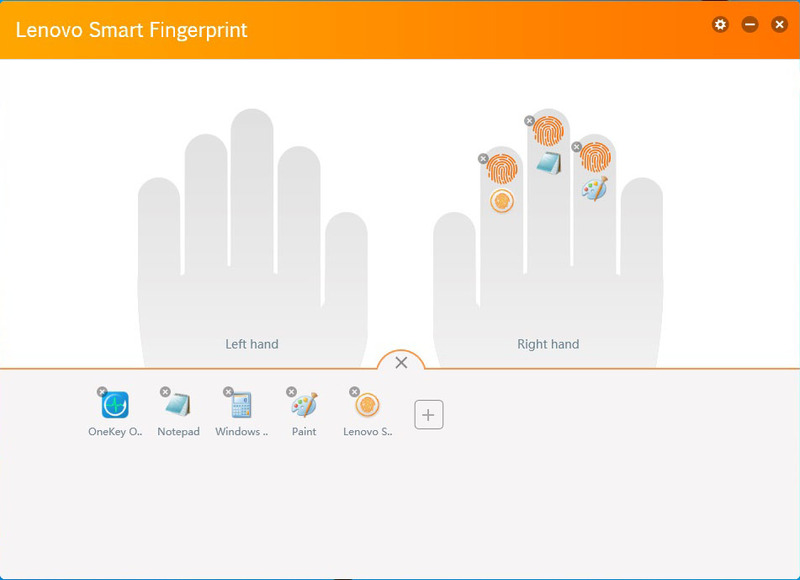 As this notebook comes with a fingerprint scanner, Lenovo have bundled easy-to-use software. 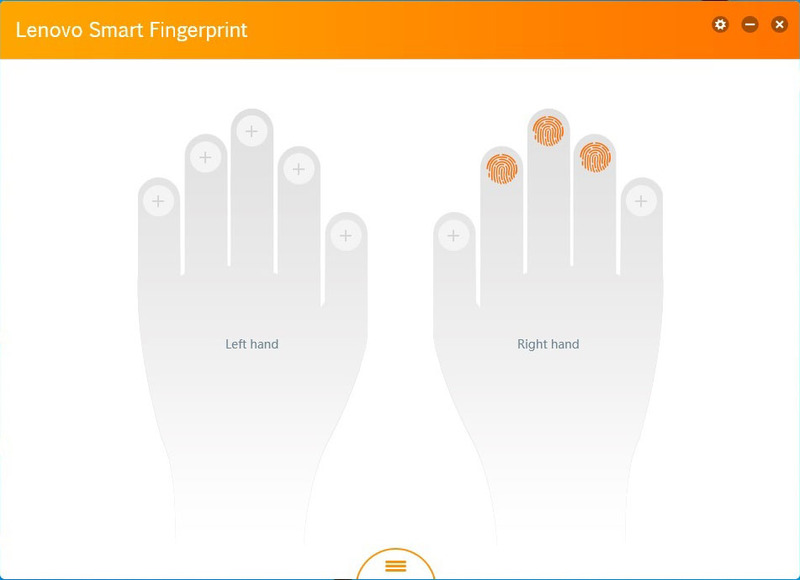 It is called Lenovo Smart Fingerprint and offers basic functionality for the scanner. You can sign in to Windows easily after you set a password for your account and use the application to record your fingerprints. This is a very easy task – just select what finger you want to use and slide it 4-5 times over the sensor. Additionally, you can map specific applications to a finger for quick launch. We would have been happier if a password manager had been included, but the functionality Lenovo have offered here is nevertheless decent. Lenovo E31-70 comes with a 2-cell, 35Wh/4400mAh battery. It seems small, but it takes up a big part of the internal space of the notebook as you saw in our disassembly and upgrade section. The notebook comes with power-efficient internals, and we believe only the Full HD IPS display might be eating up more battery. Lenovo have promised a 5-hour battery life for this device, and our tests pretty much confirmed this – the results we got in our Internet and Movies tests are both really close to what the manufacturer has promised. In order to simulate real-life conditions, we used our own script which browses through over 70 websites. We got a result of 283 minutes, or 4 hours 43 minutes. For every test of this sort we use the same HD video. Here the result is slightly better – 312 minutes, or 5 hours and 12 minutes. For accurate simulation we used the Metro Last Light benchmark running on a loop, graphics settings set to minimum. 3D gaming nearly always takes a bigger toll on the battery life and the result here is no exception – we got 95 minutes, or 1 hour and 35 minutes. 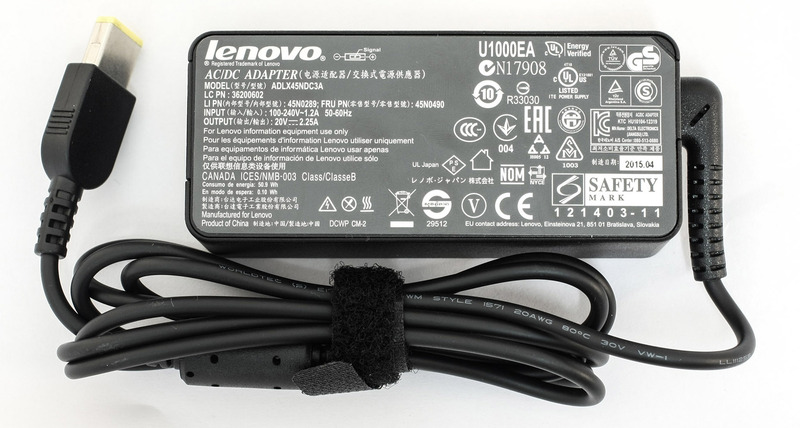 The charger included in the retail box is made by Lenovo, model numberADLX45NDC3A. It is rated at 45W. The notebook charged from 0 to 100% in 2 hours and 30 minutes. The Intel Core i5-5200U processor is part of the Broadwell family and part of the “U” series CPUs. The “U” series offers slightly lower TDP (15W in this case), two energy-efficient cores and higher clock rates in order to keep power consumption low without sacrificing the performance. The Core i5-5200U is clocked at 2.2GHz base frequency and can go up to 2.7GHz for one active core and 2.5GHz for two active cores thanks to the Turbo Boost technology. Of course, it’s based on a 64-bit architecture and it’s manufactured through a 14nm FinFET process, which means more power and less power consumption in a smaller die size that fits in smaller form factors. It also features the HyperThreading technology from Intel, which means that the CPU emulates one additional virtual core for each physical one. The CPU also features Intel HD 5500 integrated GPU – base frequency of 300MHz and 900MHz Turbo Boost. Other distinctive features are DDR3(L)-1600 Memory Controller with up to 16GB, HyperThreading, AVX, AVX2, Quick Sync, Virtualization, AES-NI, DirectX 11.2 as well as OpenCL 1.3/2.0 and OpenGL 4.3 support. It’s important to add that the i5-5200U has 128KB cache at level 1, 512KB at level 2 and 3072KB at level 3. Power consumption is drastically lower when compared to NVIDIA and AMD’s discrete graphics solutions. The controller also produces less heat since it is part of the CPU package. This makes GT2 graphics accelerators the most desirable in the ultrabook class of portables. Before we begin with this section we would like to note that the following tests do not represent real-life situations. It is extremely difficult to reach 100% CPU and GPU load under normal usage for such an extended period of time as in our stress tests, but we run them to see how the machine handles higher temperatures, and check the overall stability of the system in the long run. First we put the CPU under 100% load for an hour. Under normal usage the CPU maintained a temperature of around 43°C. During our computational stress test the temperatures of the device rose to about 68-72°C. There was no throttling of the CPU throughout the entire test. You can see the results on the graph below – CPU load in blue, temperature in orange. After the first hour of CPU stress we add 100% GPU load and leave them both running for another hour. The CPU temperature rose by just 2-3°C during the second test to around 70-75°C and remained around that level for the remainder of the test. The fans were working at nearly full power, but there wasn’t much noise coming from the device. After the stress test we measure the temperature on the surface of the device to see if the cooling system is working as it should. Lenovo have done a good job with the heat management, as the keyboard and palm rest felt cold to the touch with just a slightly warmer top center section (around the location of the CPU). You can see the results in the image below. 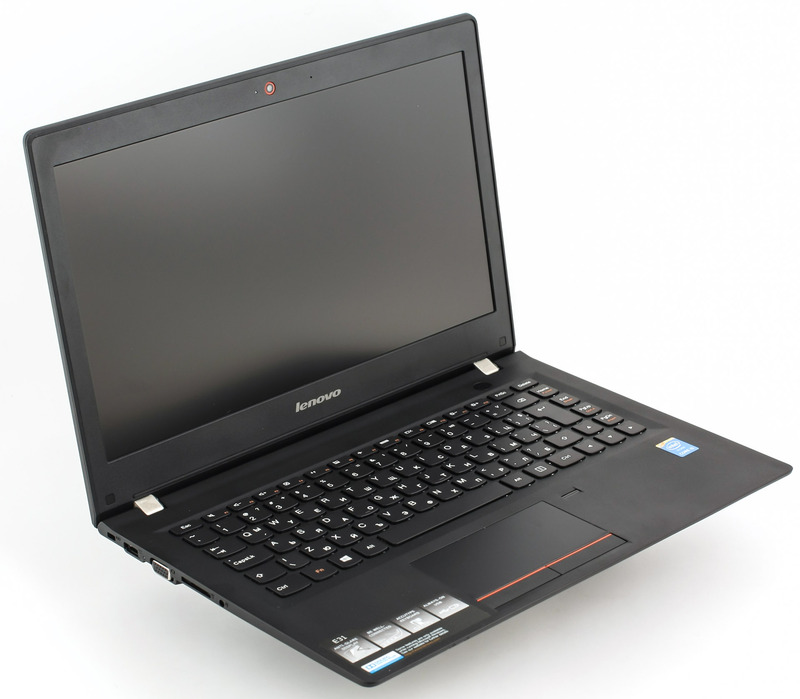 Lenovo E31 Notebook is a great laptop for its price. The design is stylish and clean. Small details sprinkled all around the device serve to remind us of the iconic ThinkPad series. It has a nice rubberized lid for good grip and sturdy build, even though it is completely made out of plastic. The flexible 180-degree hinge is a nifty little feature, and it is strong enough to hold the screen in the exact position you put it. The keyboard is pretty comfortable, the trackpad is fast and responsive. Hardware specs are pretty good for the price. It should be able to satisfy most business users and may even bring more to the table. The fingerprint scanner is a great feature that makes login easy and secure. It also allows you to easily access frequently used applications. 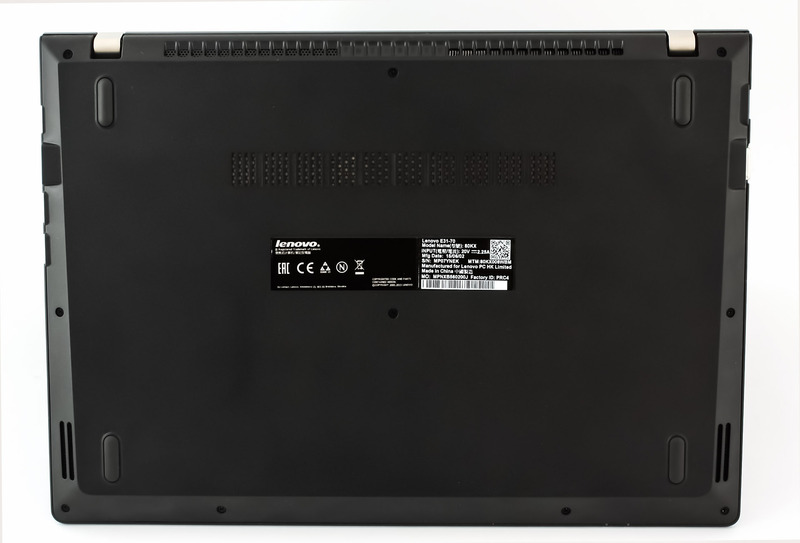 The battery offers decent life, which we rated at about 5 hours for web browsing and video playback – exactly what Lenovo have promised for this device. The 13.3″ screen comes with an IPS panel, offers good viewing angles and really accurate colors for most web browsing, office work, and movie-viewing. Unfortunately, it does not offer sufficient sRGB gamut coverage to be considered suitable for work with colors (like image processing and design). The screen also emits PWM, but at a frequency much higher than what is considered to have harmful to your brain. Overall, the device is definitely worth the money and is one of the best devices in the low-end business range. can you tell me something more about built-in webcam. Is it suitable for low-light video? I have a problem with USB 3.0 It is too narrow. Normal USB cabel or flash or even connector for mouse can not insert.